A participant plies his culinary passions in the 2019 Hilton Food & Beverage Masters contest. 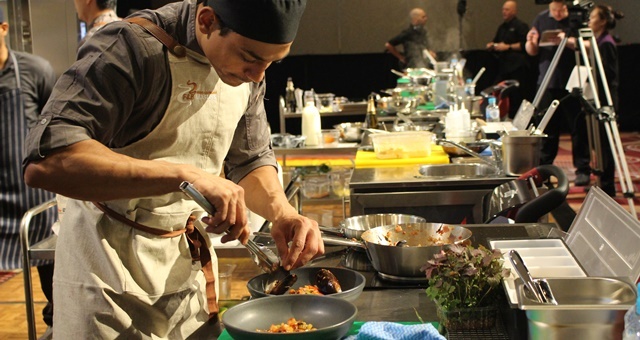 Hidden food and beverage passions and skills among Hilton’s Australasian team came into the spotlight this week as the company hosted its annual 2019 Food & Beverage Masters finals. Hosted at the Hilton Sydney, the annual showcase sees finalists from Hilton group hotels around Australia compete for titles across four F&B disciplines – the Culinary Cup, Wine Cup, Barista Cup and Bar Cup. Always a hotly contested competition, the talent pool at the 2019 edition of the event was as tight as ever, with categories open to all Hilton employees except for Executive Chefs. However, it was Hilton Brisbane which almost scooped the pool, leaving with three of the four major awards. Claiming the Culinary Cup for 2019 was Chaoyi “Charlie” Song, while colleagues Chris Barker took home the Wine Cup and Andrew Purse headed home with the Bar Cup. Hilton Sydney’s Nickie Chan was the night’s fourth winner, claiming the Barista Cup. Charlie Song, 28, is the current Chef de Partie at Hilton Brisbane and has been in Australia for 10 years, studying International Tourism and Hotel Management alongside Commercial Cookery. He has honed his kitchen craft by working at a number of the Queensland capital’s finest restaurants. 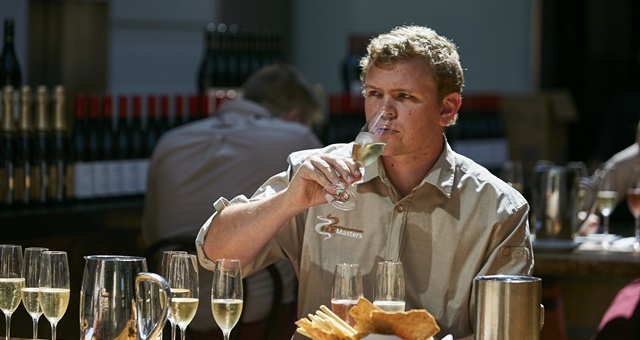 Chris Barker chalked his success from the evening down to a hardwired passion for wine, which has taken him to visit some of the world’s foremost wine-producing regions in France and Australia. He currently imparts his knowledge of wine with guests at the hotel’s main restaurant. Bartending for over a decade and at Hilton for two years, Andrew Purse holds a Masters of Hospitality, Tourism and Events Management. Hilton Sydney’s Nickie Chan’s interest in coffee can be traced back to Le Cordon Bleu Australia, where she studied and fine-tuned her craft. She currently creates her coffee art at Caffe Cino Hilton Sydney, where she has been working since the end of 2017. Entrants in the contest, as well as team members at all levels throughout Hilton, are given access to professional development to further their careers within the company. These may include on-the-job-training, virtual courses, management development programs and seminars. Hilton Australasia Vice President – Operations, Heidi Kunkel, told HM its F&B Masters event provides its region-wide workforce with a platform to build their careers within the organisation and to showcase the huge array of talent already working for the company. “It’s a really important event now in its fourth year. It’s challenging ourselves and our teams to continue to be creative and innovative, to showcase the best-in-class talents that Hilton has.